The cataloguing project is going reasonably smoothly, I’m pleased to say! I’ve been faced with lots of illegible/very faint scribbles in volumes. They may be an indication of the book’s provenance, or they may just be some scribbles. It’s a bit of an irrelevance, really, because I can’t tell what they say anyway. Not even with a magnifying glass and my specs on. I wish I could though–it might be a bit scandalous! Sir Henry Spelman, engraving by R. White. It’s an impressive beard, you must admit, and I like his hat. The book in question was The English Works of Sir Henry Spelman. It’s an anthology of Spelman’s works, in two volumes, though bound together in one. It was only after a good few minutes of hunting for the second volume that I realised this. Interestingly, most of the works were published posthumously, and these volumes were edited by an unnamed individual (also known as Edmund Gibson). 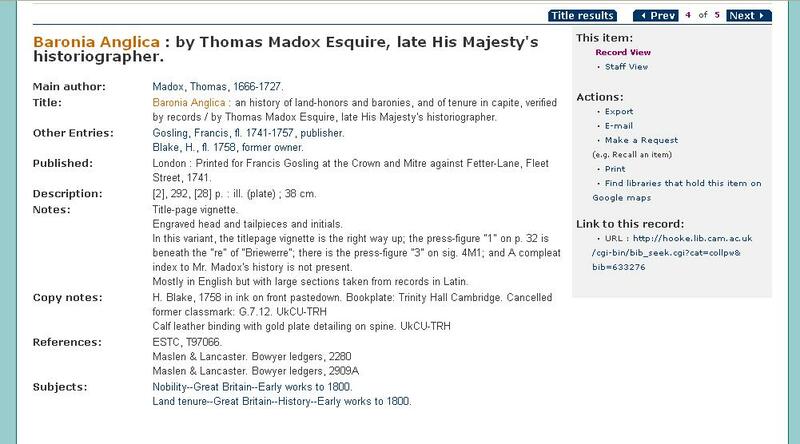 I wish that knowing this would constitute proof of my missed vocation as a detective, but in fact it was reported by the record on the ESTC at the British Library. Gibson was also the Bishop of Lincoln at the time when these volumes were published back in 1723. Spelman seemed like quite an interesting chap. Again, not just because of the beard. There’s lots of information about him on the Oxford DNB. His dates are a bit iffy, but most sources I’ve looked at suggest c. 1564-1641. 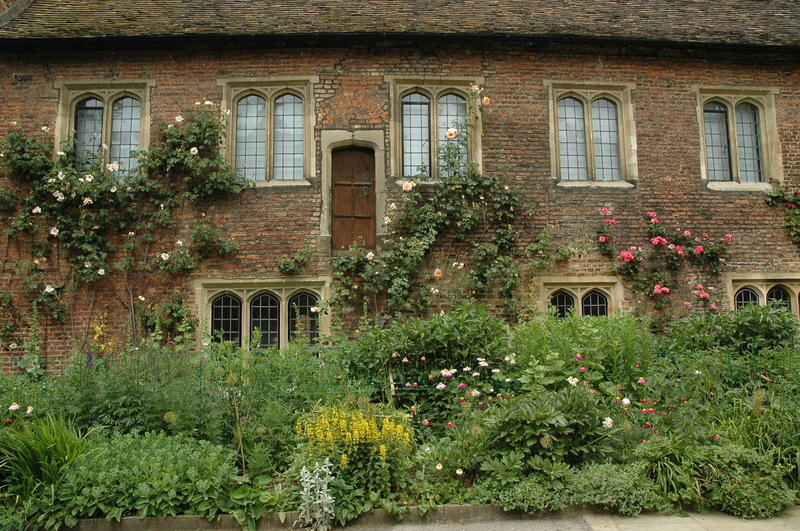 He was a Cambridge man, taking his BA from Trinity College at the age of 18, before going to Furnival’s Inn, and then later Lincoln’s Inn, for law. He didn’t last long though. Apparently the hard slog required for a career in law wasn’t something that particularly appealed, so he chose a slightly less lucrative path, and undertook to research and study the history and antiquities of the laws of England. And I can’t say I blame him—to me that sounds far more interesting. So he was an historian and an antiquarian, and from what I’ve read of his works today, a bit of a theologian as well. The works included in these volumes, then, aren’t about the laws themselves but are a series of expositions about what underpins the laws, and inevitably that tends to lead Spelman back to the ancient laws (divine, natural and human), to Scripture and to the church fathers (my favourite, St Augustine, is mentioned a good few times, which has endeared Spelman to me even more!) Even his focus is religious in nature—he seems to be keen on examining the relationship of the law and the church, with the contents of his work revealing emphases on tithes, church property, and the respect due to churches. Now, I’m pretty sure that there’s nothing revolutionary in what Spelman is saying, but his writing is richly historical and theological in its approach, and impassioned enough to suggest that these are things he genuinely cared about. I finished cataloguing this book earlier today, and my heart sank a little as I got to the end of checking the MARC21 punctuation. Not even in the slightest because I enjoy the punctuation, but because I figured that I was heading straight back to the tedium of the dreary old digest. But no! 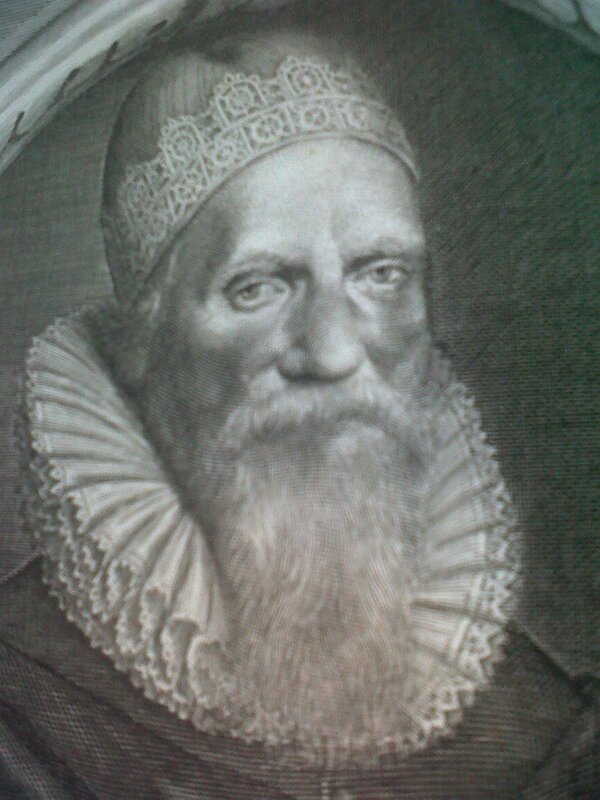 Because here is an engraving of the author of the next book I’m going to be cataloguing. He looks like a fascinating old soul. Tomorrow might just be looking up. 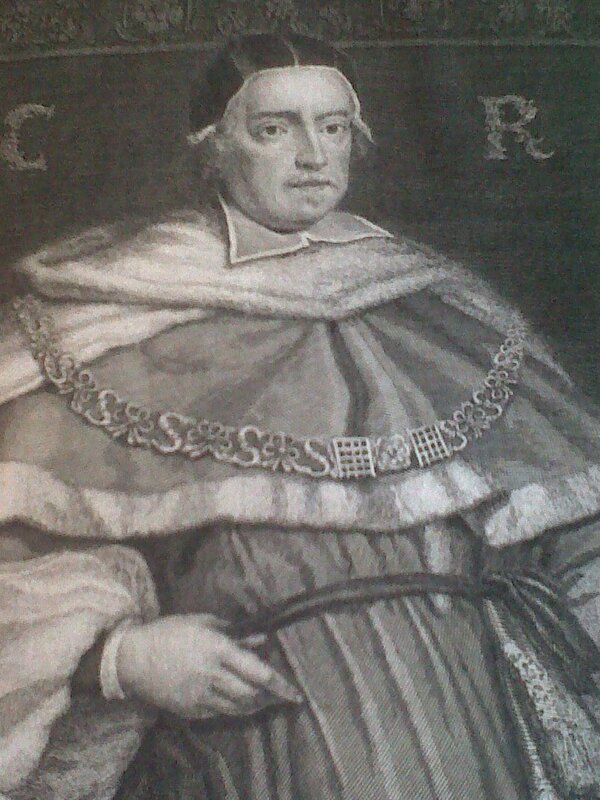 Sir Matthew Hale, engraving by M. Wright. A book that has been languishing on one of the benches in the Old Library turns out to be a fascinating copy of the “Breeches Bible” that we did not know we had! The identity of the book came to light this morning during a visit from Melvin Jefferson and Edward Cheese of the Cambridge Conservation Consortium to assess the conservation needs of several manuscripts. As an afterthought I showed them a printed Bible which I considered to be the worst book in the Old Library because it is in such a poor condition. The Bible is bound in what remains of its original thick brown leather binding, over much worn cardboard boards. There is part of a metal clasp on the back cover and the metal fixing on the inside front cover for what must have been a boss. The volume lacks a title page and the internal pages are curled, much worn and some are torn. The opening pages of Genesis have been repaired with sellotape which has become sticky and is breaking down and causing damage to neighbouring pages. There is no class-mark in the book and there is no record of it in our card catalogue. On closer inspection of the first page of Genesis, Edward identified it as the “Breeches Bible”, printed in Geneva in 1560! This has simultaneously solved the mystery of the existence of a separate title page from the Geneva Bible which had been mounted on board at some time in the distant past which is also housed in the Old Library. Further examination of the Bible has revealed inscriptions recording the names and birth dates of various family members from the early seventeenth century. The Bible has now gone for conservation to remove the sellotape (although it will leave a permanent residue). We have yet to decide how to conserve this remarkable book which has had such a chequered history! 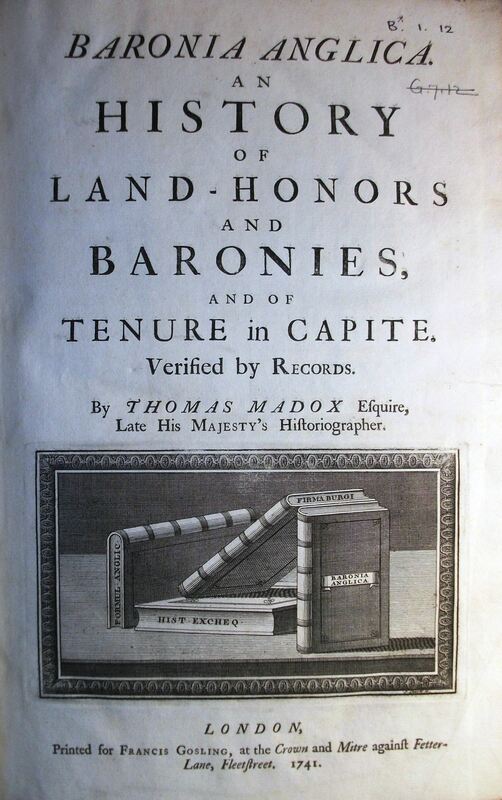 Perhaps a reader of “An institute of the laws of England” by Thomas Wood, London, 1745, thought so too! 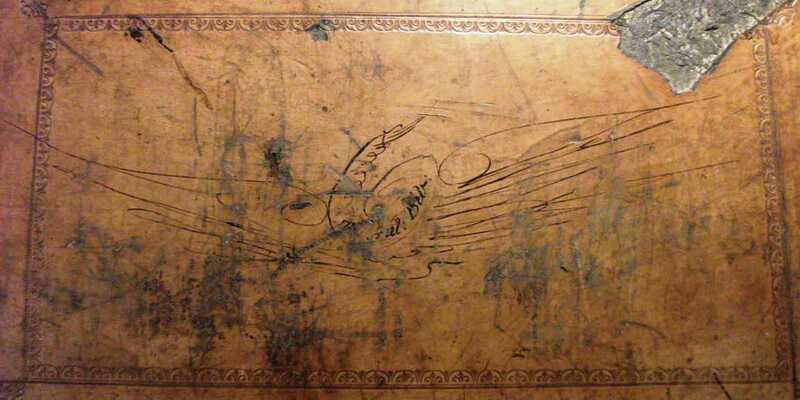 In any event, he enlivened the back cover of the book by drawing a calligraphic bird in pen and ink (image below). The words “Trin. Aul. Bib.” adorn the body of this elegant bird and pen flourishes form its outstretched wings. 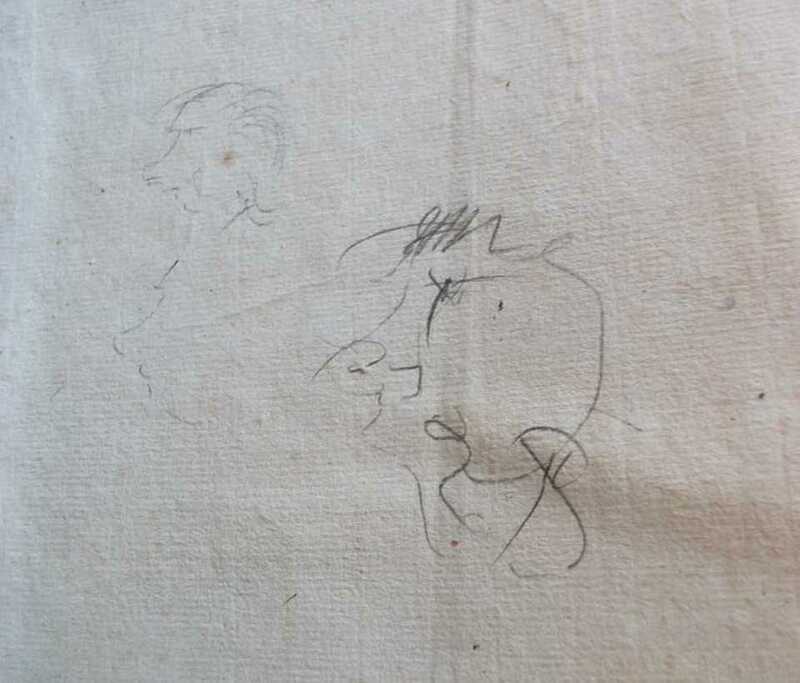 Another reader (with rather less skill) passed a few idle moments drawing some caricatures on the reverse of the front fly-leaf of “A compleat collection of state-tryals”, London, 1719. Could these possibly be attempts a likeness of a lecturer or fellow scholar at Trinity Hall in the early eighteenth century? Hello and welcome to our lovely new blog! I’m the Deputy Librarian at Trinity Hall in Cambridge and I’m utterly delighted to say that we were recently lucky enough to receive some funding from the College to embark on a challenging but very cool project to catalogue online the eighteenth-century books housed in our Old Library. It’s a bit of a mammoth task—I couldn’t even estimate how many books there will be—but it’s one I’m very excited about. Undertaking this sort of project is important for so many reasons. It’s about making the resources of the Old Library more widely available to current scholars, it’s about preserving our special collections, it’s about finding out what’s actually in there and learning more about the Old Library and maybe even about the College itself. We decided to write a blog about this project because we want to document some of the more interesting things we come across during the process of cataloguing. One of my favourite things about the Old Library is that you never know quite what you’re going to find—there are so many secrets still to be discovered, and hopefully the work that will be carried out over the next year will bring some of these hidden gems of information to light. Which, of course, we’ll be more than happy to share! Back to work, then, these books won’t catalogue themselves!